On December 2, 2017 at approximately 0100 Hours, the Tufts University Police were notified by the Somerville Police of a reported armed robbery in Davis Square. The victim who is not affiliated with the university reported that three males approached her, one suspect displayed a handgun and took her pocketbook. The suspects fled in a unknown direction. The victim was not injured. The Somerville Police conducted an area search with negative results and will continue with the investigation. The victim described the suspects as one white male, a dark-skinned male, and a third male – unknown description. The victim further advised that all three suspects were possibly wearing hoodies. An Irving St resident reported that she arrived home tonight to find a young Hispanic-looking man in her house rummaging through bedroom drawers. Doesn't look like he took anything & she caught him in time. He appears to have come in through a window off of a fire escape. Guess the window lock was not in place. Police are looking for him. Young male with a San Diego cap, about 5'4". Quite a scare. Be smart & check that all windows & doors are locked. After Somerville Mayor Joseph Curtatone denied a request from a city police union to remove a Black Lives Matter banner from City Hall, the union announced it will hold a rally to protest the banner's "disrespectful" message, according to a release from the Somerville Police Employee's Association. Personally I think their doing this will make lots of people trust them less, fear them more, and increase danger for everyone, including police. I wish they'd call it off. Worth noting that the chief of police supports the mayor putting up the banner, and the union is initiating this protest, not the police department leadership, as far as I can tell. During this busy travel season, the Cambridge Police Department would like to remind ATM users to be aware of skimming devices at area ATMs. These skimming devices are being used as part of an ongoing scheme by thieves to steal account information from customers and to defraud banks. On July 1, 2016, a skimming device (card reader) was located by a customer using an ATM at a local convenience store in Cambridge. The device was attached with double-sided tape. The pinhole camera was located on a plate over the money dispenser area. These devices are well built and appear to be part of the machine. Customers are asked to take special attention to the card reader dome, and either look over the pin pad area or the money dispenser area for any pinhole camera device. The Cambridge Police Investigations Unit is actively following up this incident and asking patrols to periodically check ATMs in local convenience stores, gas stations, and other locations. “If an ATM appears to have been tampered with, please report it right away to the local business and the police,” stated Detective Brian O’Connor of the Cambridge Police Department. 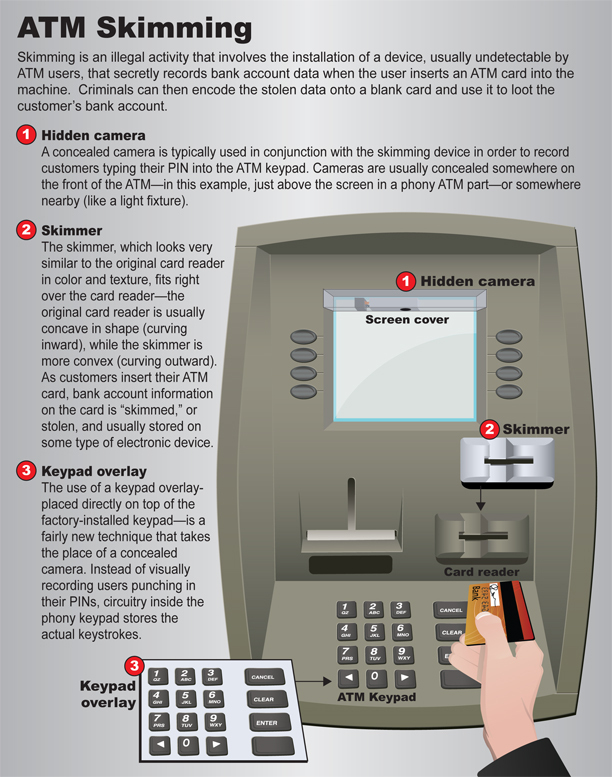 They link to this handy info graphic for basic explanation of skimming. Ward 5 Alderman Mark Niedergang sent me this and said I could repost it here (and on NextDoor). It's a response to this earlier post. Over the past few days, I've spoken with a bunch of people including the Chief of Police Dave Fallon (daily), Mayor's aide, and several of the owners of properties right near the site of the shooting and other neighbors who live right in the area. Here is what I can tell you at this point. First, and foremost, I understand neighbors' concern about safety in the area and share their concern. But I do not believe that concerns about safety in the Lowell Street area going forward are warrented. The Somerville Police Department has said that this was not a random act. The parties involved were known to each other. They are not from Somerville, do not hang out here, and are no longer here. Chief of Police Dave Fallon assured me that there will be a heightened police presence in the area going forward. I am asking the SPD to have an active presence at the Albion Street playground in that are for at least the rest of May to talk with parents and address any concerns they have. I have also asked for a communication from the City to the neighborhood. The police will be sharing more information with the public once an arrest is made. from Wicked Local Somerville: Boston man hospitalized after shooting on Lowell Street in Somerville. It happened Sunday around 3:20 pm outside 228 Lowell Street. That was right in the middle of Somerville Open Studios, so there were probably lots of folks walking around. Did any of you see this happen? I'm surprised that the police haven't made robo-calls (or, if they did, maybe I just live too far away). How sure are they that the shooter isn't still in our neighborhood? ETA: Suspect apprehended in Everett and now in custody. Early this morning, during a federal law enforcement operation, an 18 year old male Somerville resident who is a known criminal MS 13 gang member escaped federal custody while being transported in Somerville. A search is currently underway by the Somerville Police Department and federal agencies. The suspect is not armed and was handcuffed when he escaped custody. While there is not believed to be a threat to the community, please be aware that there is a heightened law enforcement presence, particularly in the Union Square area. The suspect, Gabriel Castillo Perez, is 5 foot 8 inches tall, 150-160 pounds, and was last seen near Linden St. wearing a light brown jacket, white button-down shirt, black t-shirt, blue jeans, and black sneakers. His last known address is 7 Everett Ave. If you see this individual please call 911 immeidately. If you have any other relevant information, please contact Somerville Police 617-625-1600 Again, there is not believed to be any immediate threat to the Somerville community. On September 22nd I walked into Diva around noon with 2 colleagues and got takeout lunch buffet. My total came to $10.65, which I paid with credit card. The waiter was rude, and I didn't feel obliged to tip since I was just getting takeout. Walking back to the office, one of my colleagues said he saw the waiter add $2 to my credit card receipt. I waited until the charge cleared, and sure enough, it was for $12.65. I disputed the $2 with the credit card company, which gave it back to me immediately. I'll be eating elsewhere in the future. Be careful using credit cards at Diva Indian Bistro. Apparently the Community Credit Union (in that new building next to Rosebud) was robbed yesterday, amidst all the construction issues in the square. Brand-new, black and red, seven speed, hand brakes, 24-inch wheels. Of note, it has a combination lock looped around it, so we can authenticate the bike with that combination (if no one cuts off the lock :/ ). what happened last Thursday at 3:18 pm in Davis Square? The police log shows seven people all arrested for "disorderly conduct" at the exact same time and place: April 30, 3:18 pm in Davis Square. ron_newman - what happened last Thursday at 3:18 pm in Davis Square?